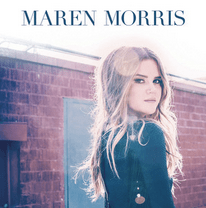 Nashville’s latest young prospect, Maren Morris, recently released her self-titled EP, her first release with Columbia Nashville. The EP, which features 5 tracks, is a fantastic introduction to an artist who has firmly established herself as one of the brightest song writers around, writing tracks such as ‘Last Turn Home’ for Tim McGraw and ‘Second Wind’ for Kelly Clarkson. The EP has shot strait to the #1 spot on the Billboard Heat Seekers Chart in its very first week, laying the foundations for what is sure to be an incredibly successful career. I have to admit, the extent to which Maren can be classed as a ‘country’ artist is debatable, but let’s be honest, if the likes of Sam Hunt and Thomas Rhett can be accepted into the genre then there is certainly a place for Maren. The majority of this EP leans towards the pop side of the genre, sometimes to the extent where it really pushes the country boundaries to their limits, but nevertheless Maren’s sound is fresh, unique and offers something new to the genre. The first track on the EP is her single ‘My Church’, an anthem for country music lovers far and wide. Lyrically, the song is so relatable and has the potential to be a huge hit. The chorus “Feels like the holy ghost running through ya, when I play the highway FM…I find my soul revival singing every single verse, yeah I guess that’s my church” instantly resonates with country listeners like myself, and the song generally feels like a celebration of our great genre. The chorus is so catchy and I guarantee you’ll be singing it all day after the first listen. This is a very radio-friendly track, and perhaps one of the most ‘country’ songs on offer here. ‘80’s Mercedes’ exposes Maren’s pop-influenced side. Maren received praise from Kelsea Ballerini on Twitter recently about this track, and this is another one which has huge radio and mainstream potential. The bass on this song is very heavy and so effective, and as is the case with most of the EP, you are left with the incredibly catchy hook ‘I’m a 90s baby in my 80s Mercedes’ stuck in your head! I have to admit, as much as I love the track, I struggle to accept it as a ‘country’ song. But hey, it’s all about opinions! The highlight for me is a track called ‘I Wish I Was’, a slower track in comparison to the rest of the EP and definitely the most ‘country’ song on offer. This is a beautifully written track, and the heart-felt, emotional lyrics are a welcome relief to the playful, rather depthless themes of most of the EP. The lyrics represent the feelings of a girl who feels like she is “not the one” for somebody and she longs to be the “hero in the story”. It has a stripped-back, simplistic melody which is so effective, and it allows Maren to showcase her superb vocals and the best of her song-writing abilities. Overall, I see this as a very impressive introduction to an artist who is certainly one to watch in the next year or so. There seems to have been a resurgence of females in country music, with artists such as Cam and Kelsea Ballerini achieving so much success on the country charts in recent months, and this could pave the way for Maren Morris. If she can continue to produce tracks of this quality, she really could be the next big star in Nashville. She will be opening for Lady Antebellum’s Charles Kelley on ‘The Driver’ Tour, then in March she will be crossing the pond to appear on the Yamaha Stage at the Country2Country festival in London.